I was so happy with the easy DIY dog bowl stand with hairpin legs we made for Szuka that I recently made a second one for her to use at my Mom’s place. She often visits with my Mom often and I feel guilty about admitting this, but she’s been eating and drinking out of (food safe) plastic containers there for years. They slide around on the floor, which frustrates her, and she always makes a huge mess, which frustrates us. 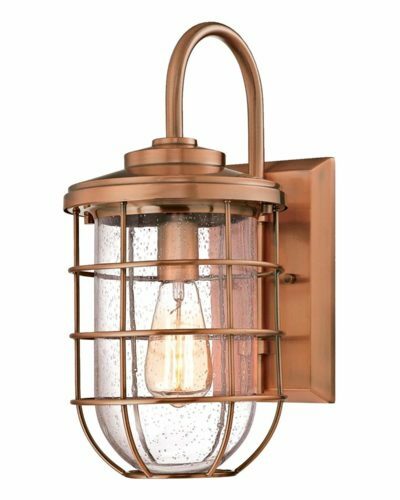 When method challenged me to tackle any messy DIY project I wanted, I knew just what I wanted to make! With my Mom’s budget-friendly pink, gold & grey kitchen makeover nearly complete, it was high time I made my Szuka-Sweetie a raised dog bowl stand to use there. 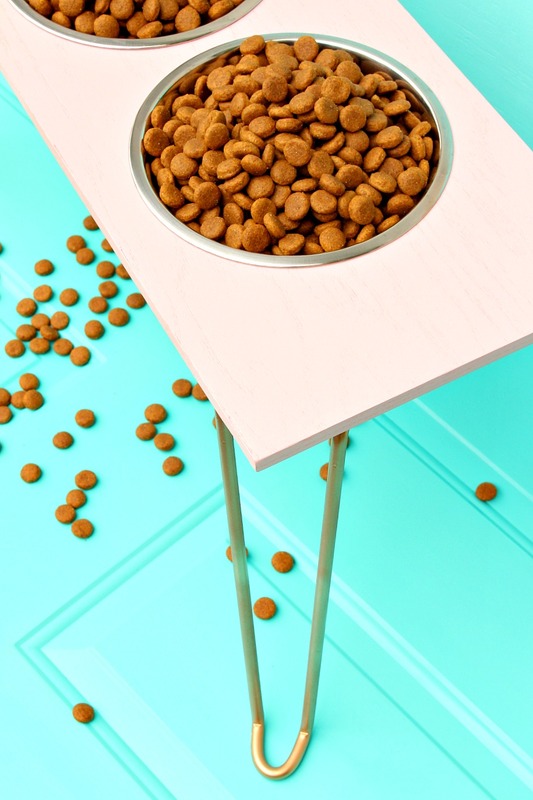 I don’t know who is more jazzed by this DIY dog bowl stand with hairpin legs: my Mom or Szuka! 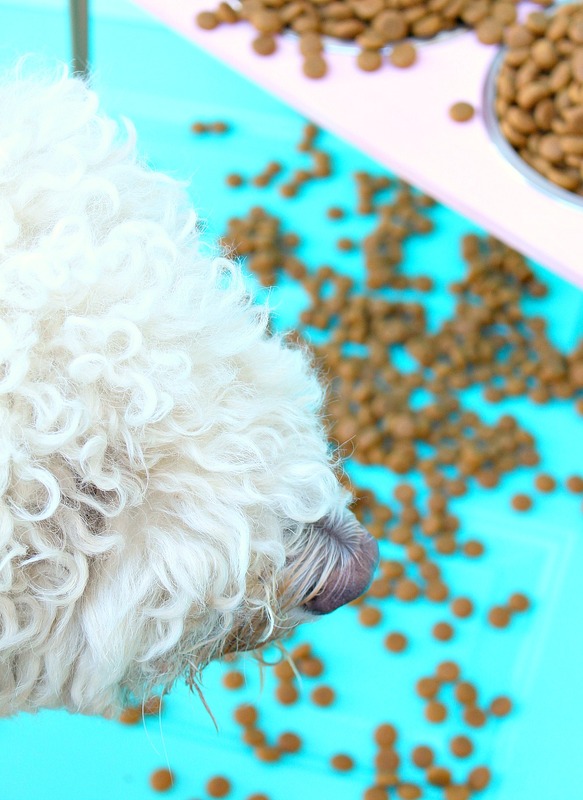 Want to learn how to make your own easy DIY dog bowl stand with hairpin legs? 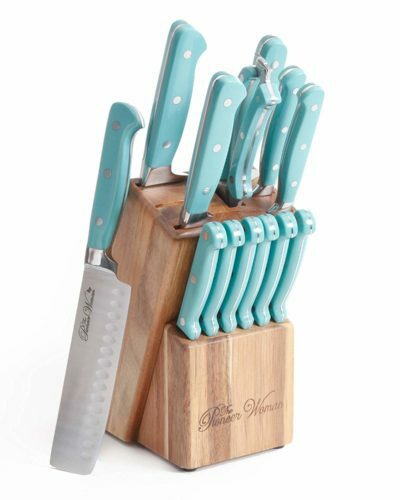 It’s deceptively easy, although you’ll need a few tools. (Some lumber yards, however, will make cuts like this for you for a small fee, as long as you provide the exact measurements). 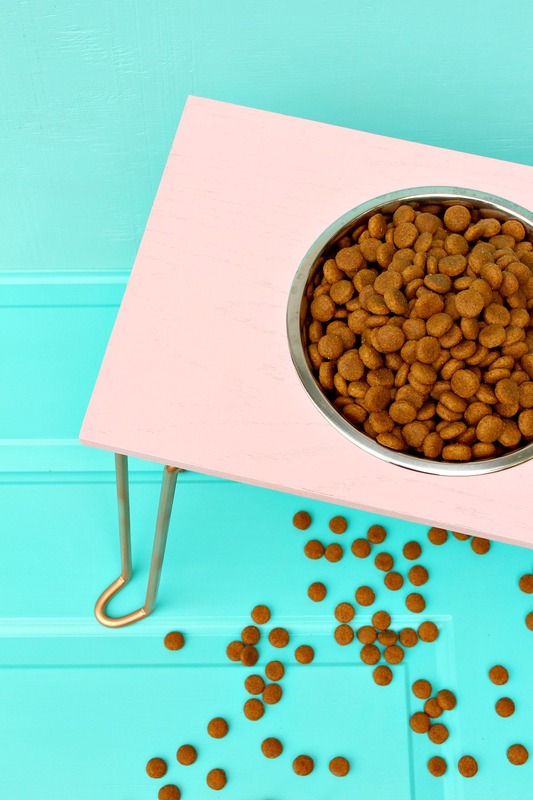 **We already chatted with our vet as to whether a raised bowl stand was a healthy choice for Szuka when we made her turquoise dog bowl stand for home. I recommend chatting with your pup’s vet about whether this is the right choice and, if so, what height would be ideal. 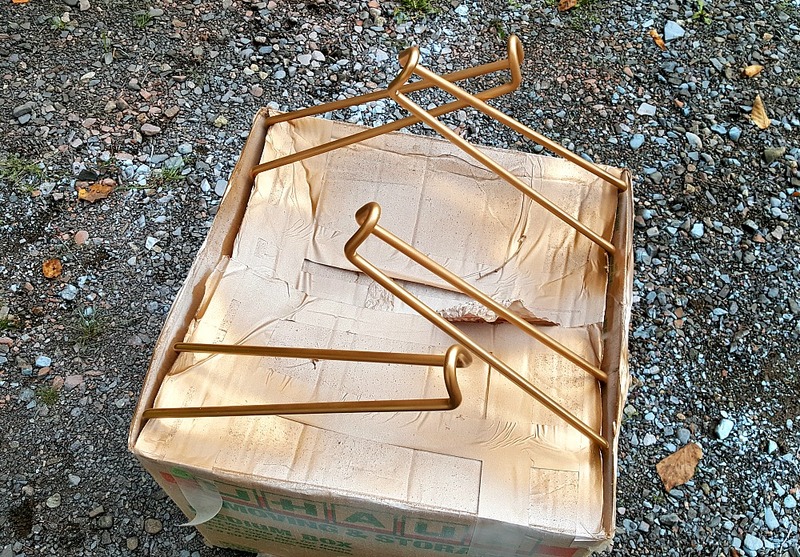 I removed the hairpin legs, which seem handmade, and gave them a blast of gold spray paint to match my Mom’s DIY brushed brass hardware and her gold mid-century tulip table. 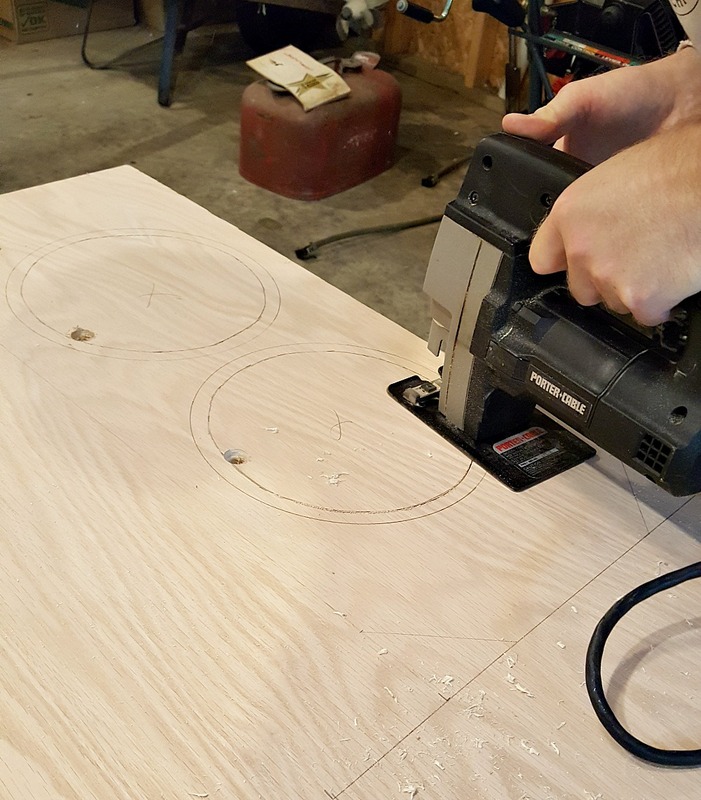 Then Hubby and I decided on the size of plywood top we would create. 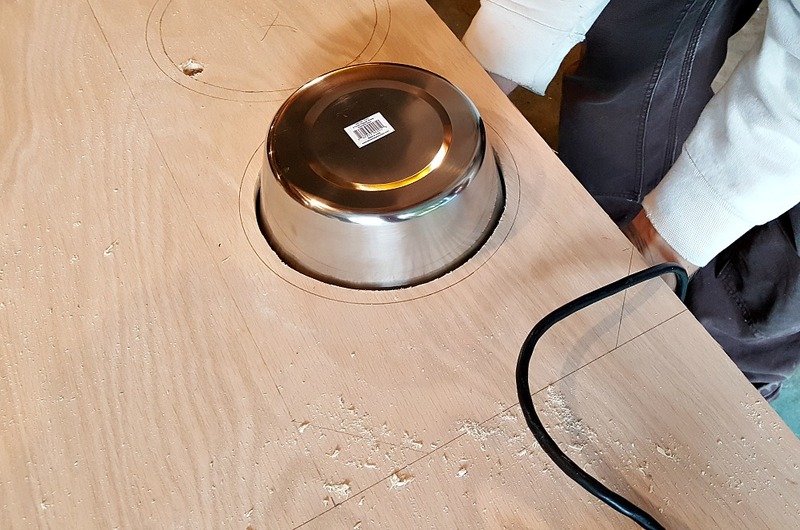 For this new DIY dog bowl stand with hairpin legs, we chose very narrow dimensions to suit my Mom’s small kitchen. 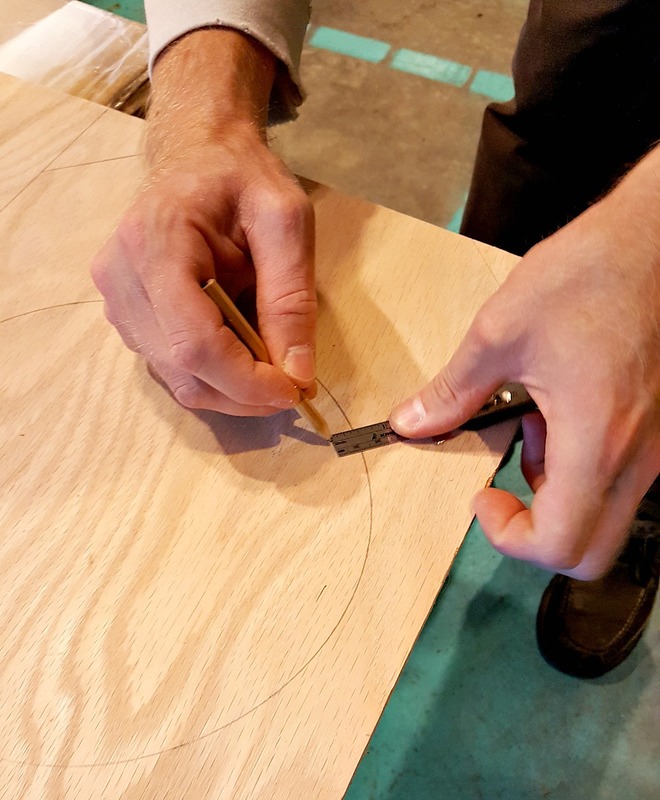 We laid out the bowls and legs and played around with placement until it seemed right and then we marked the length, width and placement of the hairpin legs with pencil. 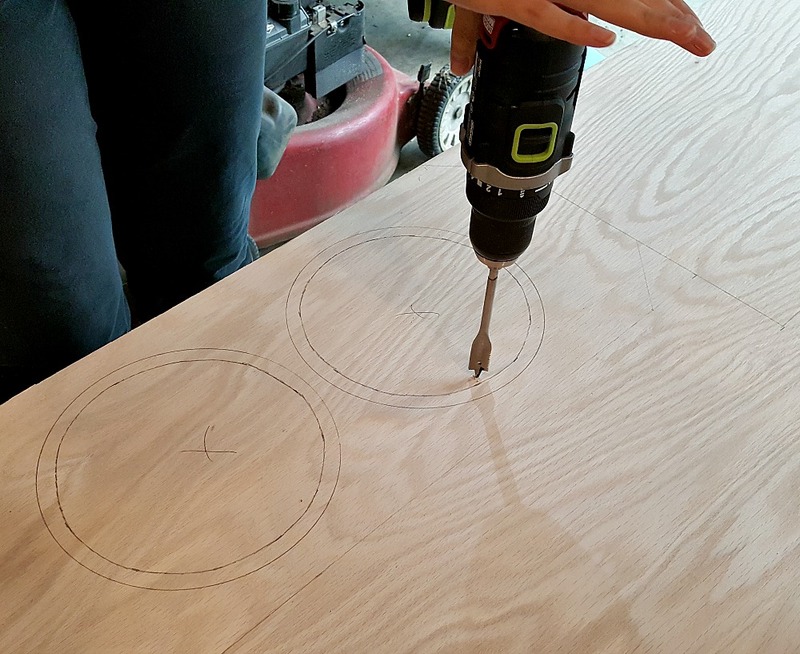 We cut out the circles before cutting the plywood rectangle shape. 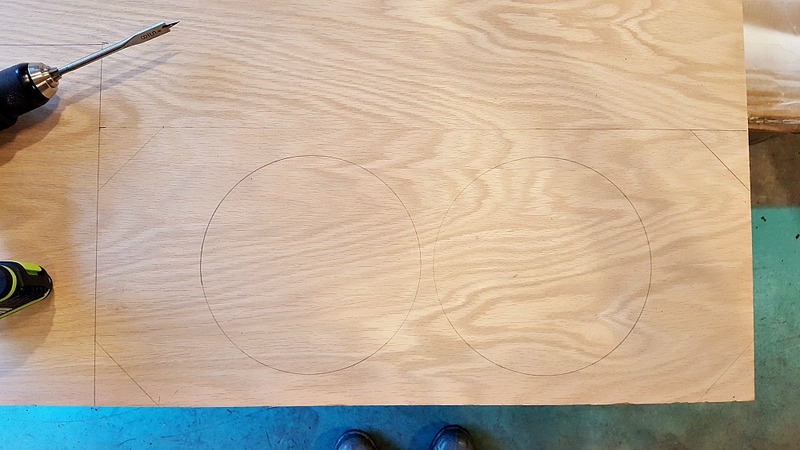 With the circles cut out, we used a circular saw (we don’t have a table saw) to cut out the rectangular shape. 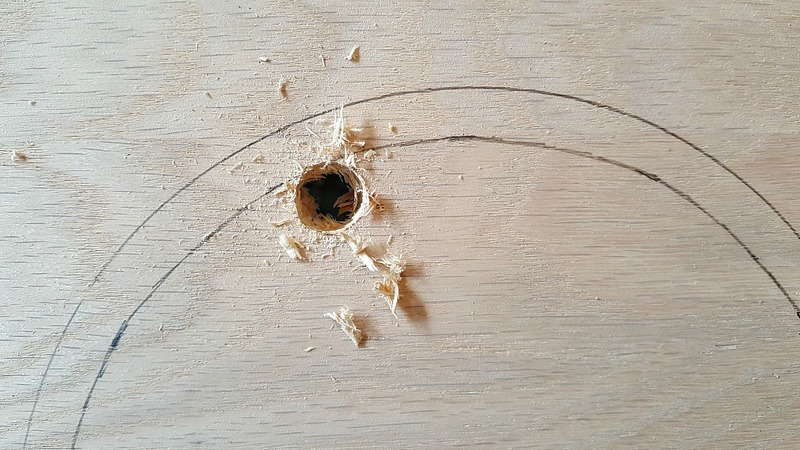 It was easier to cut the circles when the plywood was still a huge sheet, but you can switch these steps if you prefer. 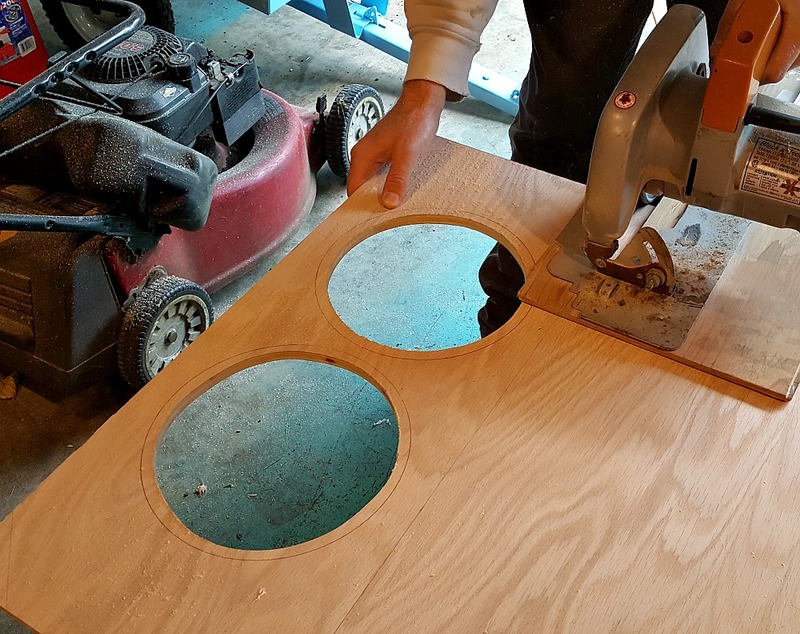 With the plywood piece completely cut out, we applied edge banding – which is really easy and gives basic plywood a much more finished look. 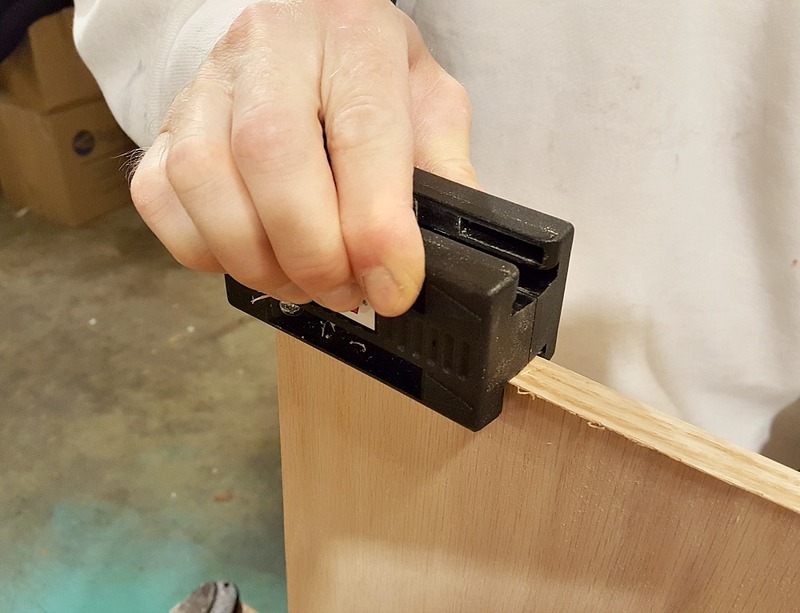 With pre-glued edge banding, it’s as simple as applying heat with an iron and then using an edge band trimmer – or a sharp knife – to trim the excess edges. Then I gave the whole top a quick sand with 220 grit sandpaper before giving it a a few thin coats of cheery pale pink primer and spray paint in one. Spraying, as opposed to brushing, the paint lets the grain shine through, which is a look Mom liked. (Szuka is ambivalent). When the paint was dry, we simply screwed on the hairpin legs and DONE! 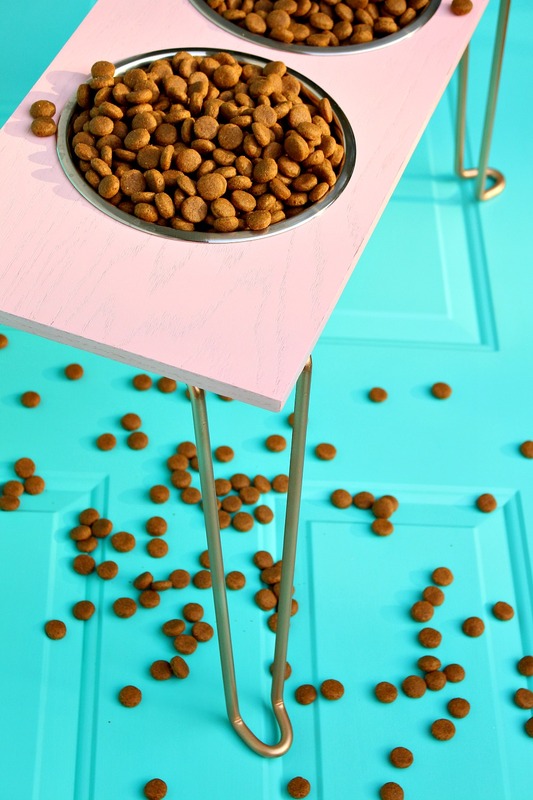 I am loving how this DIY dog bowl stand with hairpin legs turned out – those legs are so gorgeous. This is such a simple project, but it will make everyone’s life a little happier and neater! 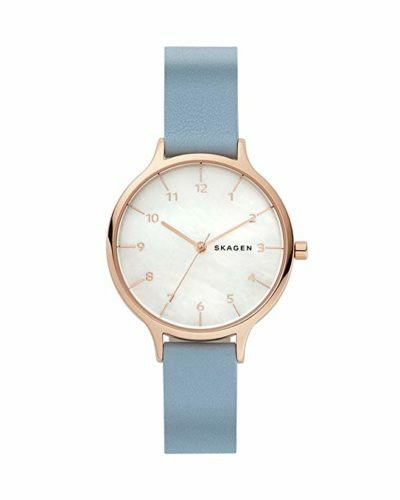 Szuka’s thinking: this is strange…it’s not turquoise. Unfortunately, even with the cute new DIY dog bowl stand with hairpin legs, sometimes Szuka is still a little bit of a messy eater. Just a little, and it’s sort of on purpose. 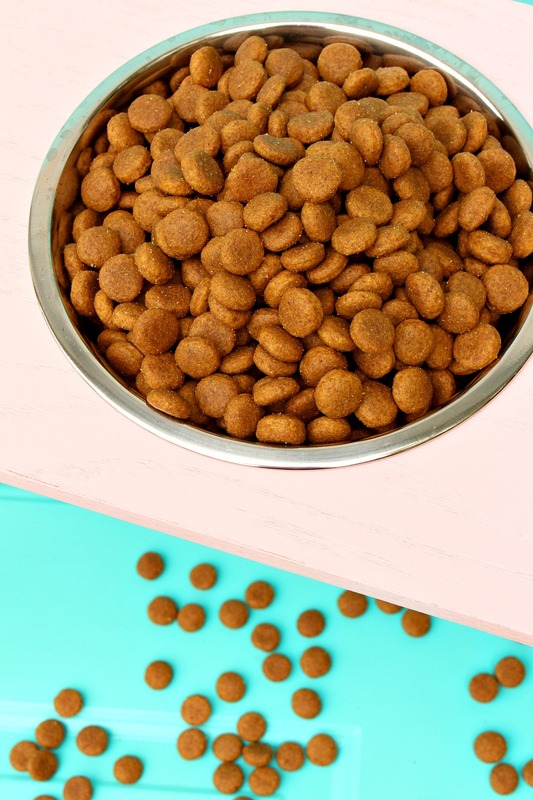 She’s picked up this weird, kibble sorting habit: even when there’s only one type of kibble in the bowl, some of it is carefully placed on the floor while other pieces are eaten. 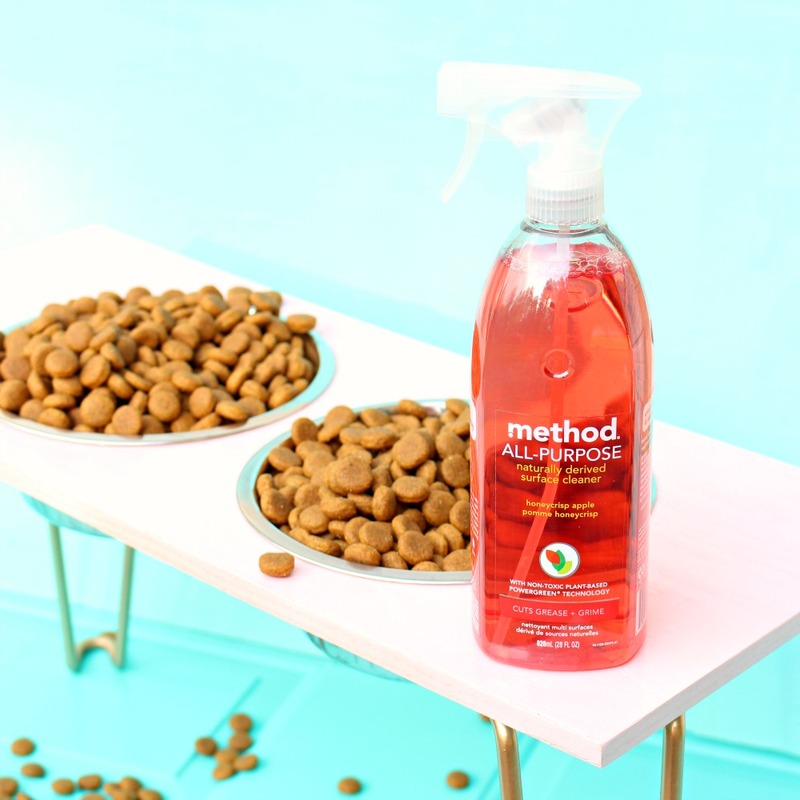 To clean up the greasy residue left by her food, Mom and I use method all-purpose spray cleaner – we’ve both purchased method products for years (my current favorite is the daily granite cleaner, which I use regularly on my new quartzite counters to keep them gleaming). 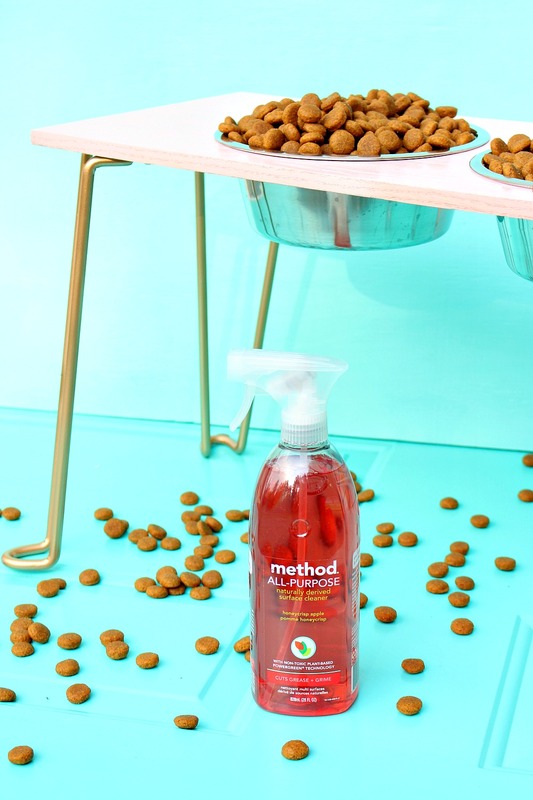 We both love that method can boast NO animal testing and NO animal bi-products, which any animal lover can appreciate. 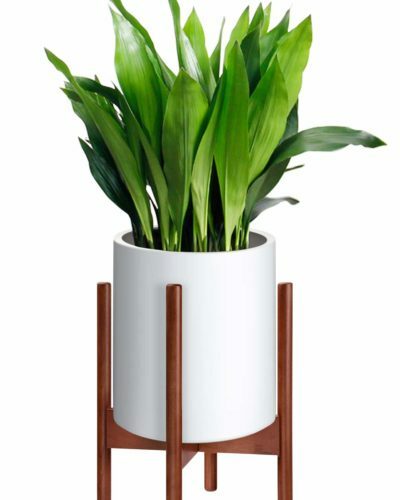 The method line is people-friendly too, with biodegradable products, plus recycled and recyclable materials. As an added bonus, it’s non-toxic – so we feel comfortable using it to spot clean around where Szuka eats. Sorry, where Szuka sorts. 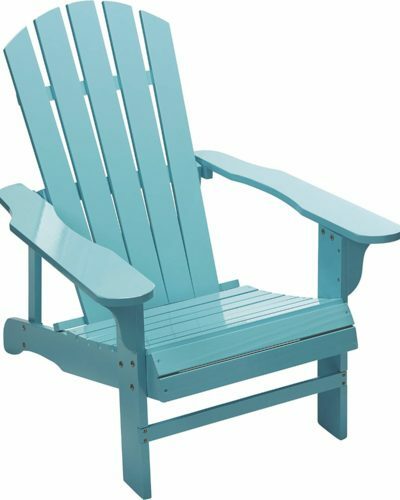 This post and DIY project were sponsored by method but, as always, all thoughts, opinions, and liberal use of turquoise backdrops are my own. 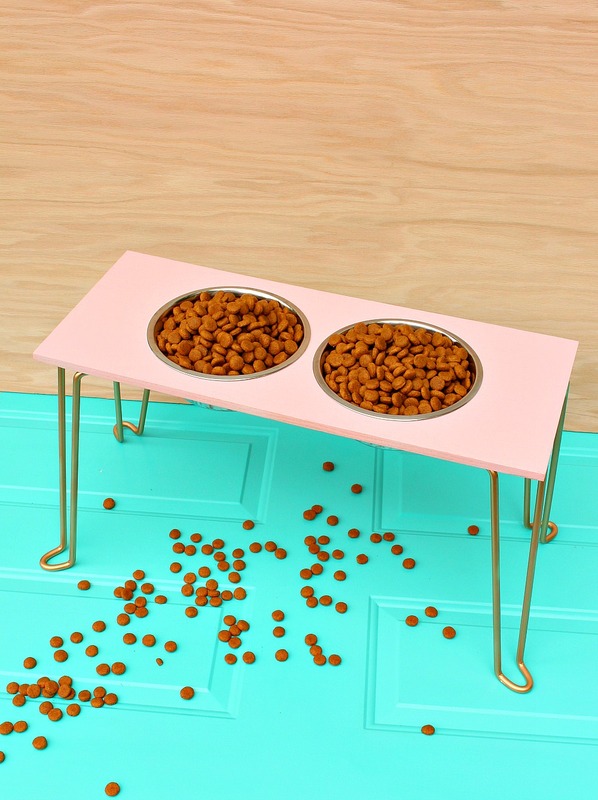 I hope you enjoyed this DIY dog bowl stand with hairpin legs project tutorial! 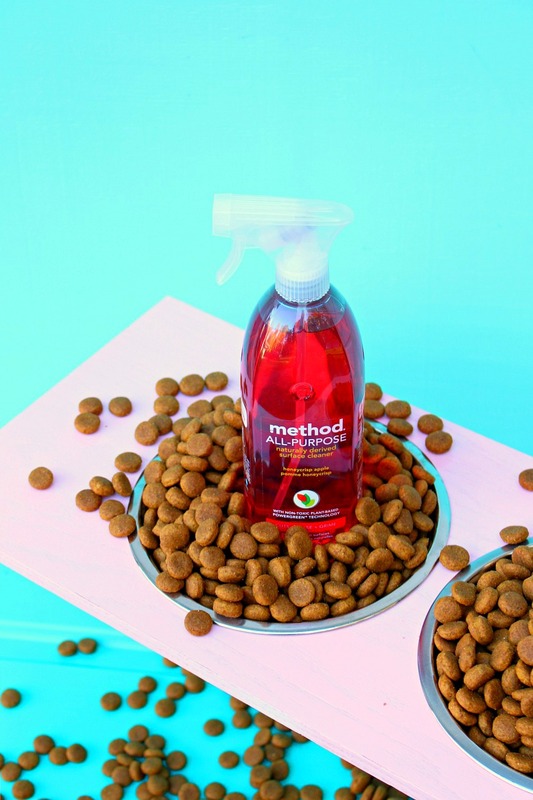 Your feeder is adorable, and I couldn't agree more about method. I have actually written them just to tell them how much I like their products. The granite countertop spray cleaner is fantastic, hubby and I end up wiping the counters all day long because we enjoy it and assume the other person hasn't wiped them yet. It's really the first time in over 8 years of marriage we've so diligently wiped the counters! 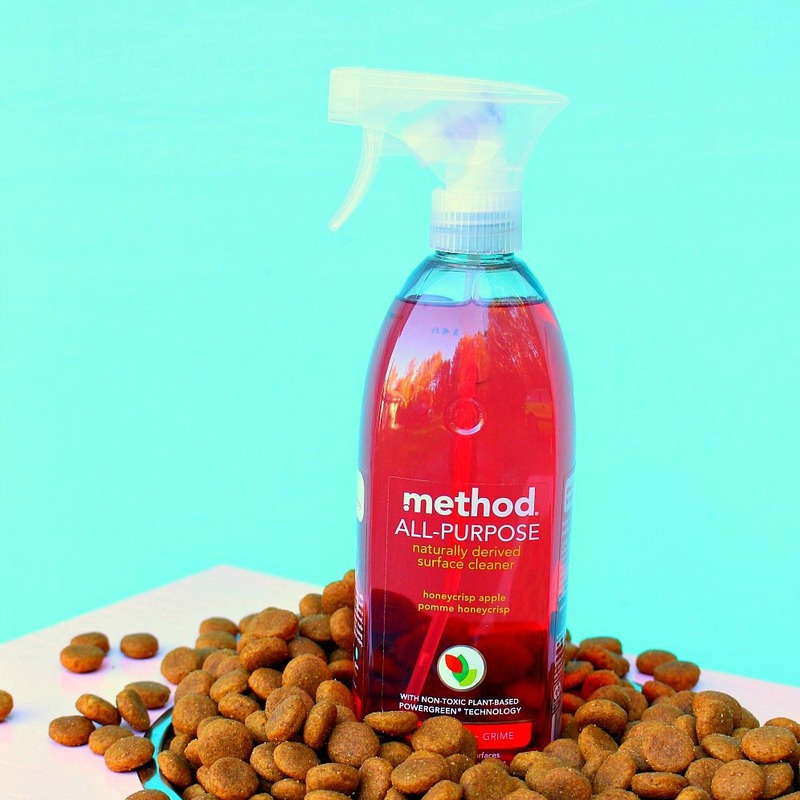 I'm so happy to hear you like method too!! I really love when I can collaborate with a brand I use and love. I have honestly never used a better granite cleaner. Wish my hubby was as smitten as yours, haha. Awww,I would share her if I could!! She's awfully stinky right now, lol. Thanks for pinning! Szuka posts are the best! Just one question though – is the pink paint you used safe for her? She may end up licking bits of it at times, right? 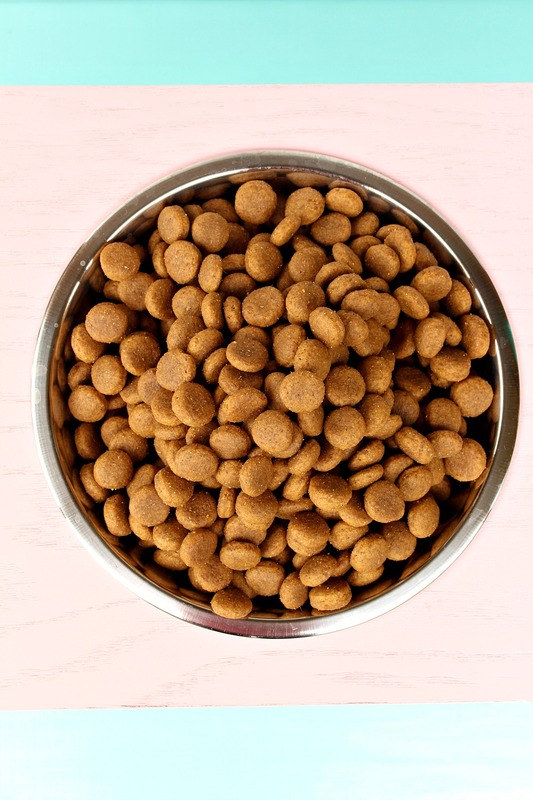 Awww she sounds so much like my dog – food sorter he is too 🙂 Although his appetite is a bit too big for his size… The Danish Oil sounds like a great alternative, thanks for suggesting it! 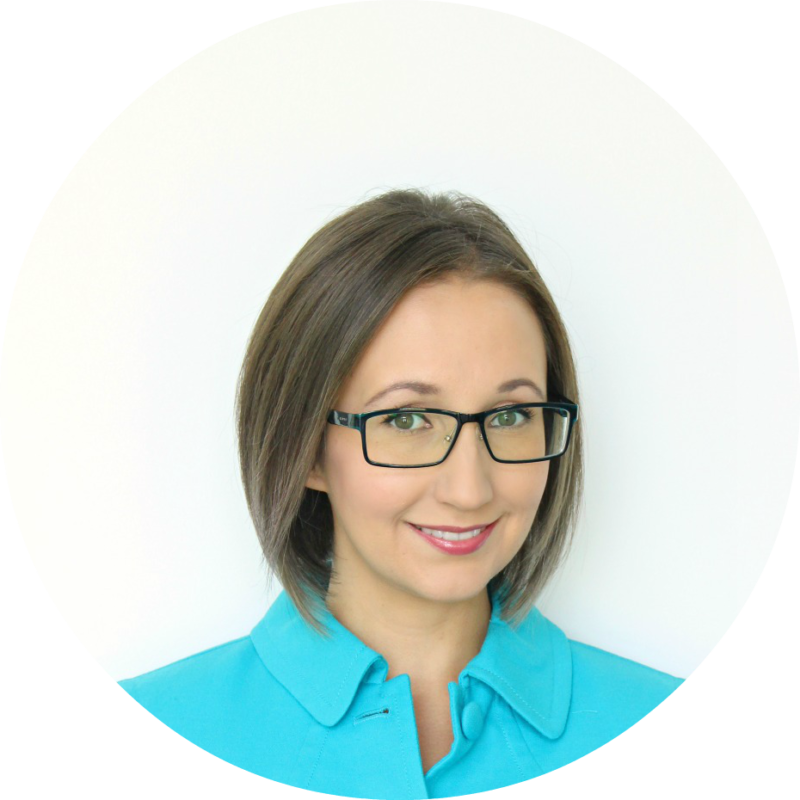 I WISH Szuka had a better appetite – it's easier to train food motivated dogs, lol. 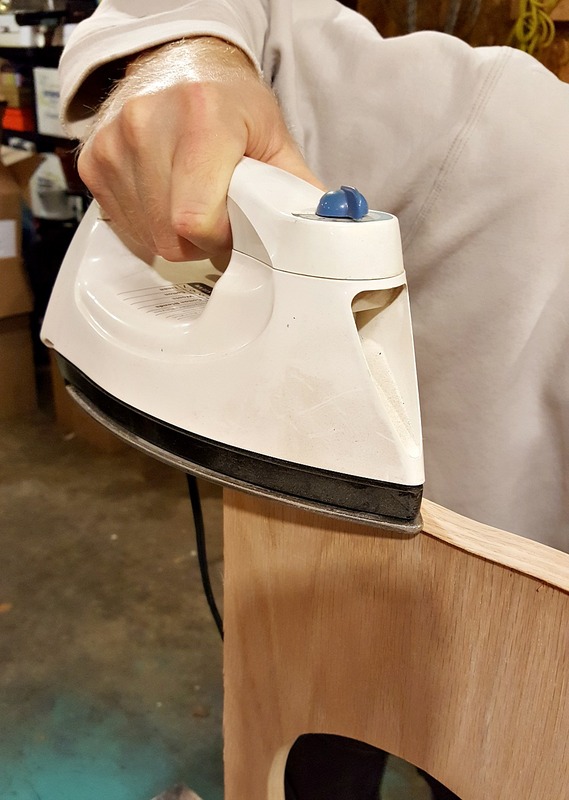 I've also seen people treat wood with coconut oil – which would be another food safe finish idea. I haven't tried it, but it's an interesting idea… Not all Danish Oil is food safe, but anything they recommend for oiling wood salad bowls, etc., would work.